One of the largest banks in Luxembourg, BGL BNP Paribas needs to proactively be on the hunt for fraud. The bank already had a machine learning model in place for advanced fraud detection. But with limited visibility into that model and limited data science resources, the model remained largely static and was in dire need of improvement. 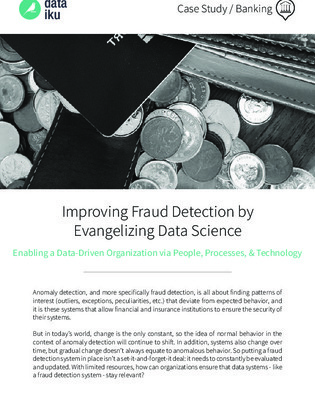 With the help of Dataiku and Data Science Studio, BGL BNP Paribas created a new fraud detection prototype in just 8 weeks, all without compromising data governance standards. Read this case study to learn if Data Science Studio is right for your business.